Inspiration can be found in so many places. I hope this collection of Biel projects, guests posts, and cool finds will inspire you to create. If you like something I've created just contact me. If you're work is featured here but I didn't give proper credit - I am sorry! Contact me so I can give credit where it is due. Just like I would love credit for any Biel project or idea. If it's your first year hosting your family gathering or just want to impress the in-laws without breaking the bank, here are a few tips I've learned or tried. Major key: Personalize it! Here's an easy Birthday Cake Hack! Best part is it only cost $25 and under 15 minutes to create. See the details to our Where The Wild Things Are inspired event for Centro Church on Father's Day. The details of your wedding day matter but don't forget to soak it all in. Ricko & Carmen wanted to go BIG for his 60th celebration so they enlisted Biel to help design the invitations and plan the shindig. He wanted a Casino Royale theme and we delivered! 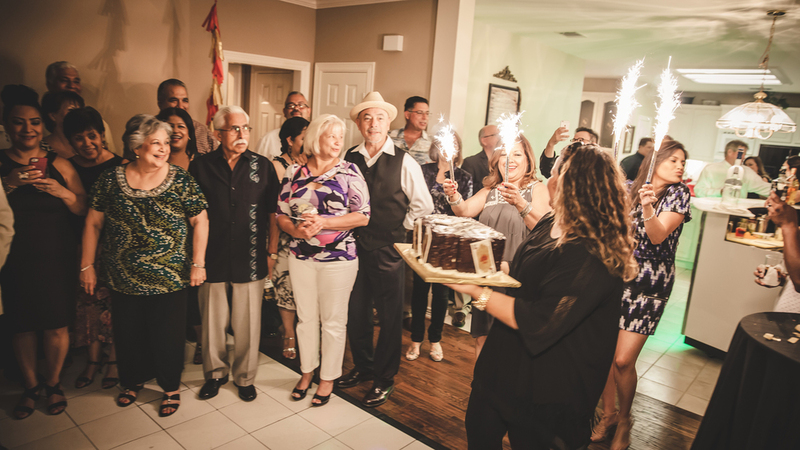 Guests were greeted with money, refreshing libations, delectable hors d'oeuvres, and more surprises. These guests came ready to double down and boogie. They definitely were ready for a party! So happy to be a part of one of Ricko's major milestones. Here are some of my favorite shots by Branden Yackevicz. Julia Child once said, "A party without a cake is just a meeting." The cake is usually the second best thing about a birthday party. First, part is the gifts, right? Here are a few cake toppers I've created for different celebrations. Let me know your thoughts below. For Lana's 1st birthday fiesta, I created these sparkling stars and we purchased the mini-piñata as the final statement piece. This cake topper & florals adorned Rosalinda's baby shower ombre style cake. A simple paper floral & pendant cake topper for Layla's 1st birthday. We created the "Layla" sign too! Created this simple and rustic cake topper for a 50th birthday party. It's probably safe to say that chocolate is my favorite flavor. I created this topper really quickly and paired it with a fun candle set found at a local party store.